In the private spaces of our homes, we can revel in the sides of ourselves that we don’t always put on display. While the kitchen is often spoken of as “the hub of the house”, the expression could be applied just as aptly to the bathroom. The bathroom is where we can let go of our public persona and get back to basics. It’s where we literally let it all hang out and come face to face with our most intimate selves. The place where we choose to spend time preparing to meet the world is revealing in more ways than one. Peruse these distinctive bathrooms and choose the one you’d most like to spend time in. See what it suggests about your personality and some tips to get the look. World of White - White is an enduring candidate for bathroom palettes. Surrounding ourselves in white surfaces makes us feel clean and fresh, and an all-white space can be calming to the senses. Love this bathroom? - You’re fastidious almost to a fault, self-disciplined and well-organised. Not prone to impulsive behaviour, you prefer a cautious and sensible approach. You value efficiency highly in those around you and may be a little demanding of others. Get the look: Successfully combining white elements isn’t as easy as it looks. Read some tips on getting the right white for your intended space. Steer clear of a clinical look by texturising the space – a snowy white sheepskin draped on a velvet chair, a white marble vanity top, accessories in glass and crystal. Add the sensory element of aroma to enrich the ambience of an all-white bathroom, with lusciously-scented bath products. Colour Chameleon -Our moods are intricately related to colours. A morning session in a bathroom that is drab and functional or safely bland can leave us so uninspired as to affect how we approach the day. On the other hand, a dose of vibrant colour is a wonderful wake-up call. Love this bathroom? Purple lovers are imaginative, intuitive and intense. Above all, they like to be noticed for their individuality. They are compassionate free spirits who can appear introverted, but they’re really only thinking deeply. Get the look: Introducing a strong colour doesn’t mean you are locked into it forever. Before you commit to expanses of permanent boldly coloured surfaces and fixtures, try painting a wall and adding accessories. A new coat of paint and an accessory swap means the whole look can be changed inexpensively. Industrial Revolution - Market demand for concrete in domestic spaces – partly a response to the rise of industrial style as a major trend – means lots of options. Choose from a spectrum of tints, smooth, grainy or pebbled textures, with a rustic patina, high-gloss finish or a waxed satiny gleam, even inlaid with brass or timber strips. On-site pouring is no longer necessary and staining is minimised by factory sealants. Fake it with no-fuss concrete-look tiles. Love this bathroom? You’re a no-nonsense, hands-on type who gets down and dirty in physical jobs such as heavy gardening and building stone walls. Then you like to clean up in a rugged rustic bathroom like this. Chances are you’re into extreme sports and survival competitions. You think scented bath oils are just plain wrong and love the smell of concrete in the morning. Green Scene - Our enthusiasm for greening up our homes has never been keener. Pantone came to the party this year by selecting Greenery as its 2017 winning colour. It seems we can’t bring enough of the green stuff inside. Create a lush personal rainforest or woodland in the bathroom and reap the benefits of having nature close at hand every day. 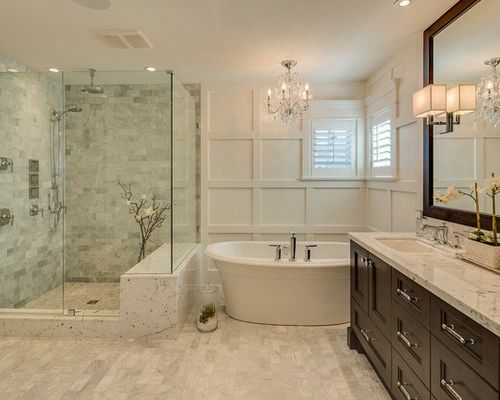 Love this bathroom? - Anyone with the heart of a gardener, even if the “garden” is a handful of houseplants. You’re patient, kind and well-balanced. If you chose this bathroom, love flows through your veins, and your love of plants extends to pets, children, family and friends. You have energy and enthusiasm to spare. Get the look: As well as bringing the outside in, taking the inside out is gaining converts. In a small closed internal bathroom, a skylight instead of a roof will bathe the space in light and keep a collection of potted plants thriving. A courtyard too small for outdoor sitting could become an extension of your bathroom, walled off and planted with flourishing greenery and connected by a large glass wall or bi-fold doors. Resort Report - Holidays in fabulous resorts and memories of mind-blowing bathrooms often linger long after we return to reality. Replicating elements of the bliss we experienced is a way of reliving those good times. Keep the things you loved in mind for a bathroom makeover when you get home – you can get the resort look and feel, if not the staff to keep it clean. Love this bathroom? -If you are attracted to this bathroom for its cool grey elegance, you are probably an undemonstrative, composed and practical type who craves stability and shies away from attention. A committed and loyal hard worker, you may appear detached and can be indecisive. Get the look: Nothing says “peel me a pomegranate and ring room service” more than a sunken bath. These last words in hedonism visually enlarge space, open up a window view and make you feel like Cleopatra. They’re not a quick-fit or cheap choice and must be planned and installed in a new build, not a renovation, with adherence to safety standard regulations. They don’t suit an upstairs bathroom or one used by children or those with mobility issues.